Home Flower Care	Wildflower Wedding Flowers on a Budget! Wildflower Wedding Flowers on a Budget! Exactly One year ago today, we featured the second post in our Budget Series! A series of themed wedding flower inspirations done with the Budget Bride in mind! 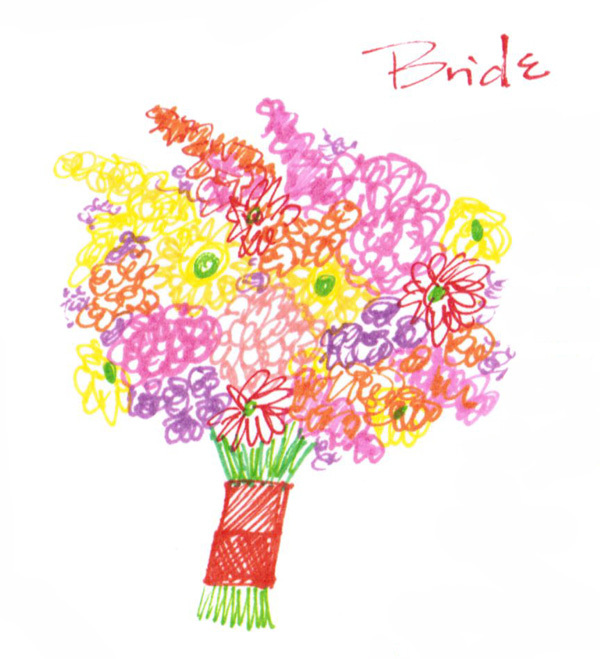 And let’s be honest, what Bride isn’t on a budget these days?! This Budget Series post was based on a Wildflower Wedding, and it got a great response! This inspiration is perfect as we head into Fall, so I introduce to you, (whether is be the first or second time! 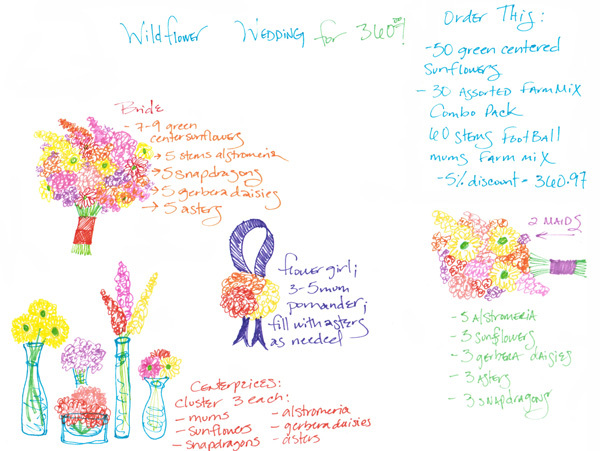 ), Wildflower Wedding Flowers on a Budget! With this Wildflower Wedding Inspiration you can create a Bridal Bouquet, 2 Bridesmaids Bouquets, 2 Mini Bouquets, 1 Flower Girl Pomander, 5 Boutonnieres, and 8 Centerpieces! 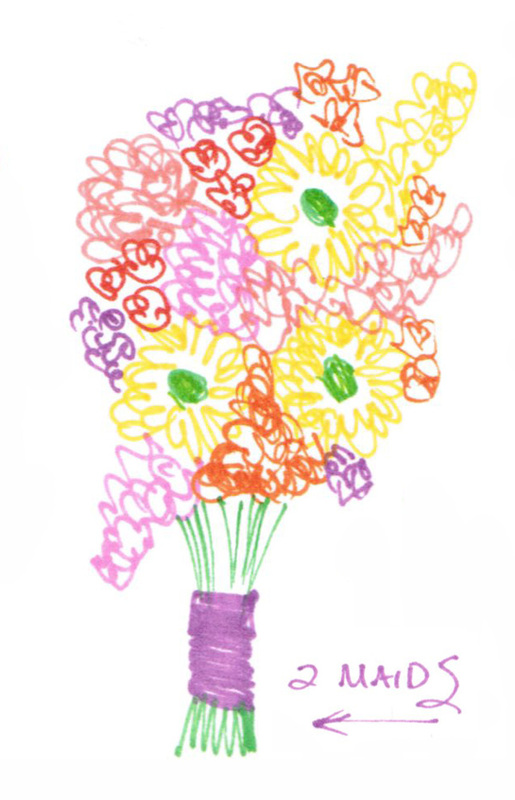 And because this is a part of the Budget Series, you get all the flowers you need for $360, after the 5% discount! The great thing about the Assorted Farm Mix Combo Pack is that you get an awesome assortment of focal and filler flowers in different colors all in one pack! To create the Bridal Bouquet you will use 7 Sunflowers, 5 stems Alstroemeria, 5 Snapdragons, 5 Gerbera Daisies and 5 stems Asters. Finish with ribbon or fabric in your color choice. To make 2 Bridesmaids Bouquets, use 3 Sunflowers, 5 Alstroemeria, 3 Gerbera Daisies, 2-3 stems Asters, and 3 Snapdragons in each one. Finish each girls bouquet in a different colored ribbon! For the Men, make 5 different Boutonnieres! 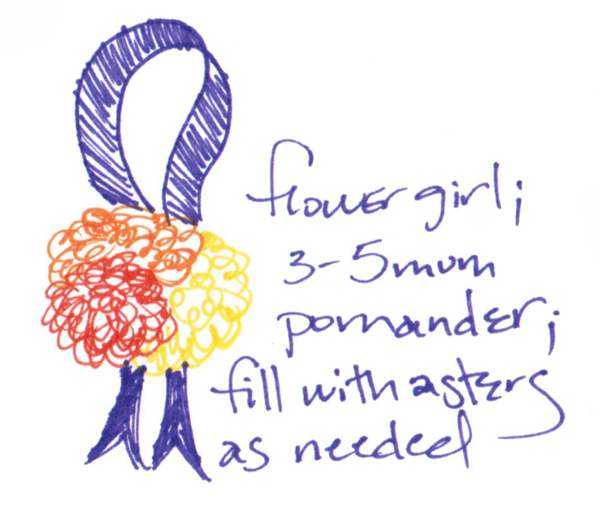 Use the smaller flowers… the Asters, Alstroemeria, and the Snapdragons, or a combination thereof (not the Gerberas, Mums, or Sunflowers). For the snapdragons, you can wire a few of the heads together or use the tip of the snapdragon to make your bout. To see some videos on how to make a boutonniere, check out our videos here. For the Flower Girl or Junior Bridesmaid, you could create a Pomander or Kissing Ball. (We also have a video or a blog post on how to make this too!) For a small pomander you will use about 3-5 Mums, then fill in any empty space with the Asters. For the Moms, use a single Sunflower! Accent with a ribbon or leave natural. For the Centerpieces, use either small vases ie. wine bottles and do eclectic mixes, clusters of mason jars down a long feasting table, or vintage fiesta ware for a pop-art effect. You can create 8 Centerpieces, each including 3 stems of these flowers: Mums, Sunflowers, Snapdragons, Alstroemeria, Gerbera Daisies, and Asters. 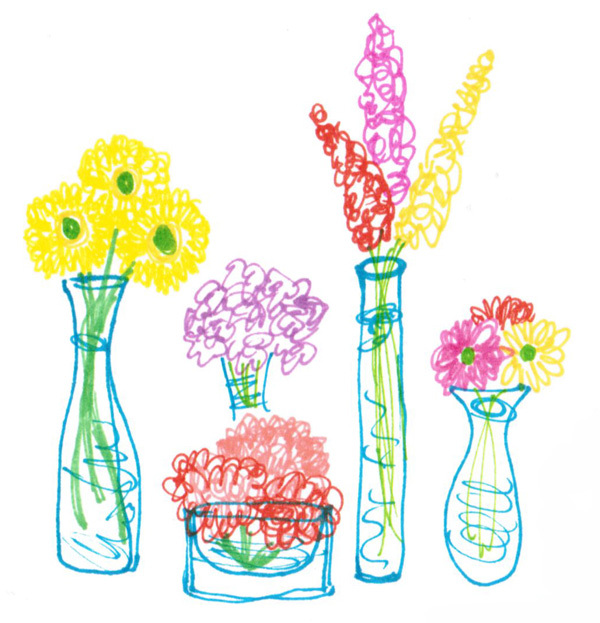 Divide up your flowers (shown above) or mix together to create your own unique look. Hope you enjoyed this second showing of our Budget Series: Wildflower Wedding! To check out more in our Budget Series, Click Here! Featured FiftyFlowers Review: Country Carnations!